A new kind of TMS. Our mission at Haven is to transform trade by making transportation logistics effortless. Haven TMS is built from the ground up to help your team drive down costs, save time, and make smarter decisions. We make logistics management collaborative and easy by simplifying complex workflows and enabling you to connect to all of your providers in one place. From procurement, to document management, to payment, Haven TMS offers you cloud-based solutions to reduce supply chain volatility and help your business grow. This is the future of transportation management. Your team. Your relationships. One platform. Break away from disorganized, cluttered email inboxes that slow down communication. Our real-time messaging tools are organized around shipments and workflow. Coordinate booking and document management, leverage powerful and intuitive permissions features, and synchronize task management. Your geographically remote teams work as one, with each other and with external suppliers, warehouses, and partners. It’s a competitive world out there, and data delivers an edge. By switching from “data silos” - emails, spreadsheets, disparate systems - to a single platform, you’ll know exactly what’s happening in your supply chain. 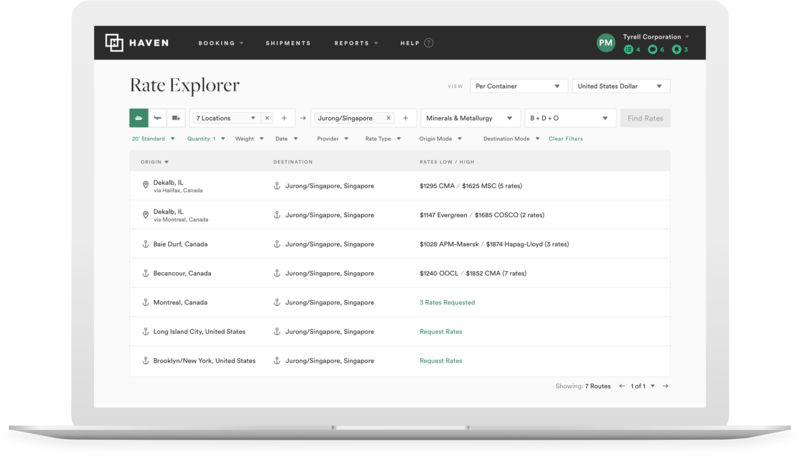 Haven TMS gives you visibility into what matters: what you’re paying, where your cargo is, how reliable your providers are, where rates are headed. We turn data into insights. You make better decisions, and save time and money. The core of transportation management is technology that gets your products to their destinations, efficiently. Haven TMS provides you with the best possible way to manage relationships with your existing carriers, and to source new partners as needed. No more repetitive tasks, phone calls or spreadsheets. Manage rates, book, and pay for shipments seamlessly, all in one place. Best of all, you’ll reduce costs and drive down freight spend while you do it. Haven—It’s a new way, a better way, and a faster way to coordinate global trade. Get in touch to request a personalized demo. Henry Bath is proud to be associated with the Haven platform for marine freight movement. The platform allows not only for rapid response to the market but the ability for us to enhance our service offering to clients in marine logistics.